Suited for high-speed 4-stroke cycle diesel engines, Premium BlueÂ® SAE 15W-40 Oil is designed to meet 2007 model on-highway exhaust emissions. Product is formulated to optimize corrosion protection for all engine parts and to provide soot control and shear stability. Oil performs in emissions treatment equipped with sophisticated emissions control hardware, including exhaust gas recirculation, diesel particulate filters, and Caterpillar ACERTÂ® technology. LEXINGTON, Ky. (Oct. 9, 2006) - Valvoline today announced that its Premium Blue® SAE 15W-40 engine oil, endorsed and recommended by Cummins Inc. for its Heavy-Duty diesel engines, exceeds the requirements of the American Petroleum Institute (API) Service Category CJ-4 specification for use in high-speed four-stroke cycle diesel engines designed to meet 2007 model year on-highway exhaust emissions. The new formulation will be backwards compatible and meet the requirements of API CI-4 Plus and CI-4 categories. 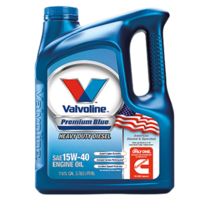 Valvoline's Premium Blue engine oil is designed to provide advanced lubricant performance in modern emissions treatment equipped with sophisticated emissions control hardware, including all types of exhaust gas recirculation (EGR), diesel particulate filters (DPF) and Caterpillar ACERT® technology. "Valvoline has worked closely with Cummins to upgrade Premium Blue in preparation for the new API requirements," said Fran Lockwood, Senior Vice President of Technology at Valvoline. "This high-performance engine oil is designed to meet the most demanding needs of both 2007 engines and pre-2007 engines." Premium Blue is formulated to provide longer and better corrosion protection for all engine parts and to provide advanced soot control, as well as greater shear stability. In addition to API CJ-4 performance, Premium Blue meets the requirements of Cummins CES 20081, DDC Power Guard 93K218, Mack EO-O Premium Plus '07, Volvo VDS-4 and MB228.3, and the proposed CAT ECF-3. With Premium Blue SAE 15W-40 engine oil, engine manufacturers' recommended drain intervals can be maintained in pre-2007 engines with the use of low or ultra-low sulfur diesel fuel. Premium Blue customers can still enjoy the Cummins-approved extension of standard drains for Cummins ISX and ISM engines. Due to market demand, Valvoline All-Fleet® Plus SAE 15W-40 and Premium Blue® Extreme full synthetic SAE 5W-40 will remain approved for API CI-4 Plus products until market conditions change. Valvoline All-Fleet Plus SAE 15W-40 has met the engine test requirements of API CJ-4. Valvoline, a division of Ashland Inc., is a leading worldwide supplier of automotive and industrial products and services sold in more than 140 countries. The company markets Valvoline® motor oil, Pyroil® automotive chemicals and refrigerants, Zerex® antifreeze, Valvoline All-Fleet® engine oils, Premium Blue® engine oils and Eagle One® truck appearance products. For further information, call 1-800-TEAM-VAL (1-800-832-6825) or visit Valvoline on the World Wide Web at valvolinehd.com.